What Is a Good Food That I Can Cook on a Diet? What Is Good to Serve With Crab Dip? 4 What Is a Good Food That I Can Cook on a Diet? 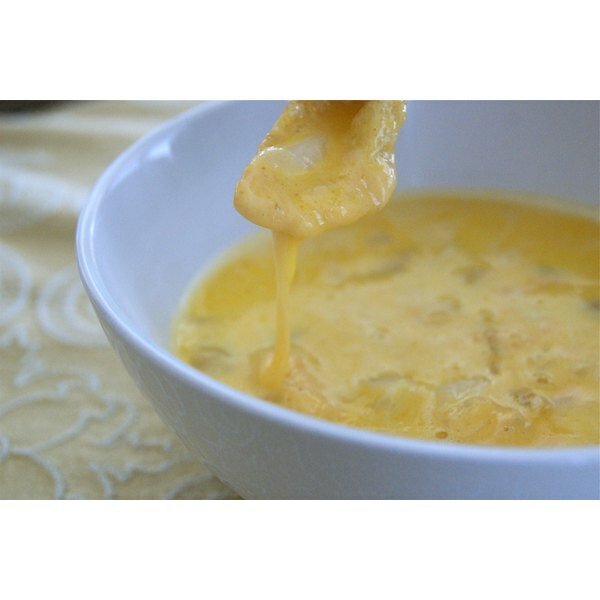 Homemade Mexican queso -- or cheese -- dip adds a flavorful touch to many meals. You can spoon it over various dishes or simply scoop up some of this gooey dip with other foods, such as chips or vegetable sticks. When you make queso dip, you have a great deal of control over its final flavor. You can modify the recipe and the proportions of the ingredients in a way that sounds good to you. For example, you can include other spices, or use different types of cheese. Heat the oil in a large pan and saute the onions over medium heat until they are translucent and somewhat soft, about 5 minutes. This will make their final flavor milder; skip this step if you want the onions to be crunchy and full-flavored in the final dip. Put the cheese and milk into the pan and turn the heat down to low. Stir constantly as the cheese melts. When the cheese is fully melted and blended with the milk, add the chilies (and the chopped onions, if you did not saute them first). Stir well to blend. Keep the queso dip warm as you serve and eat it. You can do this by keeping it in the original pan over very low heat or by transferring it to a slow cooker or another warming device. Use half Cheddar and half Monterey Jack cheeses if you do not have a preference. If you like one more than the other, however, feel free to adjust the amounts of each cheese to suit your personal taste. This is a very basic queso dip recipe. You can modify it to suit your personal taste, for example by adding minced garlic, or stirring in sour cream, or including diced tomatoes, or incorporating spices of your choice. What Goes Well With a Lamb Shank Dinner? Can You Fry Tilapia With Rice Flour?